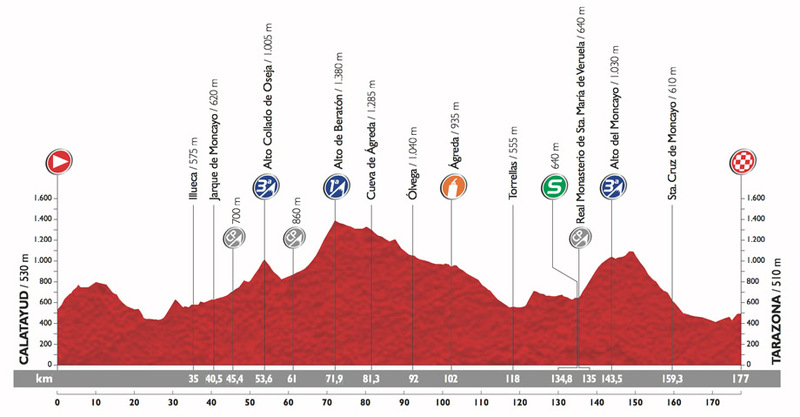 On a day which was always going to be one for the breakaway, 24 men escaped the peloton and then let Portuguese Time Trial Champion Nelson Oliveira (Lampre-Merida) ease away on the final descent to win in the grand fashion, solo, well clear into Tarazona after 168 rolling kilometres from Calatayud. Oliveira had plenty of time to zip up and straighten his jersey then take a bow for the crowd with a win which he made look remarkably simple as he slipped away from some of the best breakaway riders in the world. The move of the day had it’s beginnings not long after a warp speed first hour which saw 44.6 kilometres covered - and it was a ‘biggie’ with 24 men up the road; including Mikael Cherel (AG2R - La Mondiale), Jérôme Coppel , Sylvain Chavanel (IAM Cycling), Ruben Plaza, Nelson Oliveira (Lampre - Merida), Jelle Vanendert (Lotto Soudal) Nicolas Roche, Segio Henao (Team Sky), Davide Arroyo (Caja Rural - Seguros RGA), Julien Simon (Cofidis), Kevin Reza, Kenny Ellisonde (FDJ), Jose Joaquin Rojas (Movistar), Romain Sicard, Yukiya Arashiro (Europcar) and Pawel Poljanski (Tinkoff - Saxo) Cameron Meyer (Orica-GreenEdge), Steve Cummings (MTN-Qhubeka) Gianluca Brambilla, Niki Terpstra (Etixx-QuickStep) and Alessandro De Marchi (BMC). With Sicard the closest to Aru at inside seven minutes and Rojas the quickest - but the chances of a sprint are slim; the attacks will begin to fly from the break inside that last hour. It was always going to be a day for the breakaway with a lumpy, bumpy parcours with three categorised but not overly brutal climbs – and a lot of wind about. However, a group this big is always a surprise; generally, two dozen is too many to form a cohesive unit. But with 60 K to go the mega break still had 4:30 on a peloton which wasn’t panicking and had Astana at it’s head riding tempo for young Fabio, his skinny frame wrapped in the red of leadership. As the 50 K to mark approached, the lead slipped under four minutes with Astana turning the volume up a little and the ‘fly men’ in the break began to think of how to conserve energy and give guys like Terpstra, Chava and Cummings the slip. Aru chalked up a successful (if non-eventful) first day as race leader. With 42 K to go, Brambilla nips the sprint bonification but that’ll only be of significance if the break gets over six minutes and Brambilla and Sicard are in the frame for leadership – unlikely now. Chava and Oliveira are caught and Poljanski goes now as the two dozen split into half dozen’s behind the 25 years-old, 2012 U23 Polish National Champion; they’re all keen to avoid the Astana chase – anything but look at those orange shoes the Kazakh boys are sporting . . . The climb tops out with 38 K to go – it’s largely downhill now and with the lead back over four minutes the signs are good for the breakaway. Oliveira again now, he’s Portuguese Time Trial Champion so he’s no stranger to the solo effort and is descending nicely, tucked down on the top tube - but it’s not technical enough to grab big swathes of time. Behind, Cummings freewhweels at the back of the break looking very relaxed, that won’t have escaped the attention of Terpstra and Chava. Oliveira has 19 seconds at 20 K – meanwhile, back to the orange shoe boys, it’s five minutes plus so the day will definitely belong to one of the 24 banditos. 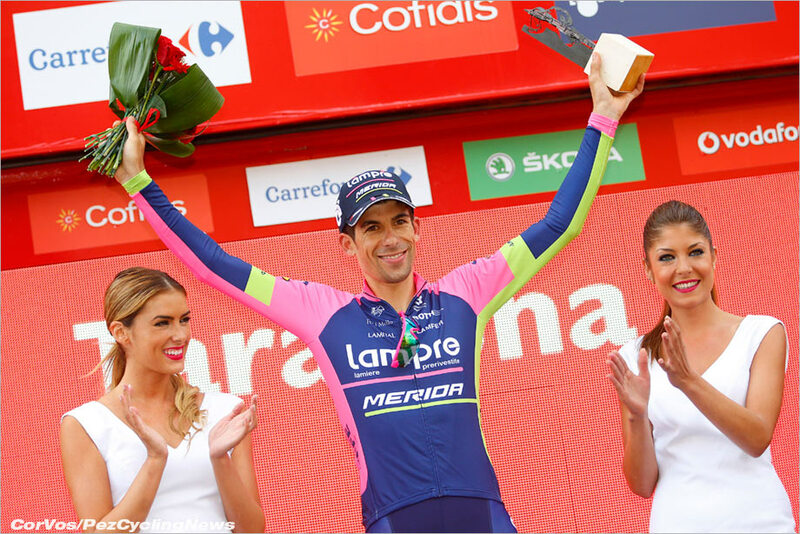 With 15 K to go the Lampre man has 40 seconds and the gap is widening all the time; behind, his big amigo, Plaza rides shotgun, marking everything that moves – nice team work from Lampre as the gap goes close to the minute at 10 K to go. This looks won and lost inside nine kilometres to go as Oliveira’s DS realises it’s a good Vuelta for the sheet metal boys after all and bangs his encouragement on the team car door. Terpstra leads the break, grabbing GC time for Brambilla is his gig, now – the stage win is certainly gone as Oliveira holds firm on the minute with the Saxo and Movistar powered peloton trying to haul it back below five minutes. Oliveira wins in fully professional fashion with his 23 erstwhile companions rueing their decision that; ‘he’s not worth chasing, he’ll come back . . .
A terrific win for the Portuguese; if not a great stage for the TV viewer – unless you’re Nelson’s mum and dad that is. 10. Romain Sicard (Fra) Team Europcar 0:02:51.